Tokyo, Japan –Sony Corporation today announced the commercialization of "IMX060PQ", a new type 1/2.5 CMOS image sensor "Exmor™" for use in camera enabled mobile phones that leverages Sony's proprietary formation technology to realize the industry's smallest unit cell size (1.4µm), and the industry's highest pixel count*1 (12.25 effective megapixel resolution). "IMX060PQ" is designed to meet the increasing need for advanced image quality within mobile phone enabled cameras. 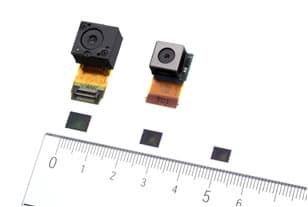 Sony also announced the launch of "IMX046PQ", a type 1/3.2 CMOS image sensor "Exmor™" with 8.11 effective megapixel resolution, and "IMX045PQ", a type 1/4 "Exmor™" CMOS image sensor featuring 5.15 effective megapixel resolution. Below: CMOS Image sensors "Exmor™" (from left to right)"IMX060PQ" "IMX046PQ" "IMX045PQ"
In recent years, the convenience offered by cameras in mobile phones has driven an increase in their use, while demand for higher image quality has also continued to grow. In addition, as mobile phone designs have become more refined, and models become smaller and thinner, the need for further miniaturization in mobile phone camera technology has also increased. To meet these requirements, improvements in both image quality and sensor miniaturization must be achieved, but the more the shrinking process is continued, the more difficult it becomes to gather light into the sensor pixels, leading to the risk of image degradation resulting from reduced sensitivity and S/N levels. The newly developed CMOS image sensor "IMX060PQ" leverages Sony's proprietary formation technology to deliver the industry's smallest unit cell size*1 (1.4µm), and the industry's highest pixel count*1 (12.25 effective megapixel resolution). The implementation of a Cu process that achieves extremely fine interconnections, together with the sensor's unique pixel structure and improvements in condensing efficiency have realized high sensitivity levels and a high S/N ratio, despite the industry's smallest*11.4µm size unit cell. Furthermore, Sony's proprietary "Column-Parallel A/D Conversion technique" minimizes image quality degradation cased by noise that arises during analog processing, while also enabling higher pixel count and frame rates (10 frames/s for "IMX060PQ" and 15frames/s for "IMX046PQ"). By enhancing its "Exmor™" range of CMOS image sensors, used in product lineups such as digital SLR cameras and high definition digital video cameras as well as mobile phones, Sony will aim to meet customer needs for advanced imaging performance comparable to dedicated compact digital still cameras in slimline, camera enabled mobile phones. *2Picture of sample of Lens module "IU060"
"Exmor™" and are registered trademarks of Sony Corporation.